The Subsea Company Hotline Control Panel uses only name brand components and is engineered for a safe and reliable hydraulic testing. Our design is built for long-lasting durability and offers tremendous visual aids to make the process quick, easy and safe. 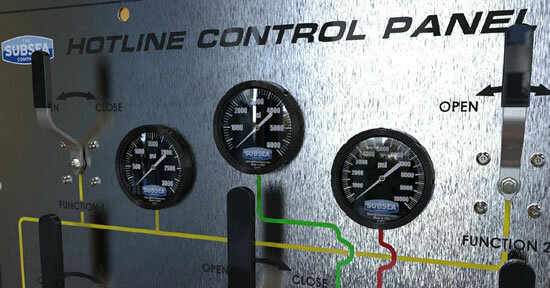 The Hotline Control Panel is designed to allow the user to test hydraulic components and systems utilizing available rig hydraulic sources up to 5,000 PSI. The rig’s hydraulic power unit (HPU) feeds the Hotline Control Panel providing fluid to three hydraulic circuits for testing second BOP stack, individual hydraulic components or systems. The low pressure regulated circuit can be adjusted from 300-1,600 PSI and the medium pressure regulated circuit is adjustable from 500-3,300 PSI. The unregulated circuit is at full supply pressure. Test pressures and available hydraulic source pressure are viewed on Subsea certified pressure gauges.